A detailed analysis of Pauling's research on immunology, the structure of hemoglobin and the nature of sickle cell anemia – a four-decade program of work that would lead to Pauling's famous fascination with vitamin C.
Linus and Ava Helen Pauling forcefully spoke out against Cold War militarism, nuclear proliferation and radioactive fallout. 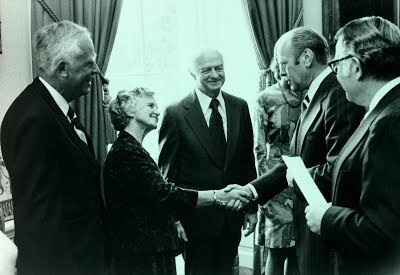 For his work as an activist, Linus Pauling received the 1962 Nobel Peace Prize. An unprecedented accounting of Pauling's life from 1930 to 1960, presented in searchable, easy-to-use calendar form. Includes document summaries, scanned images and full-text transcripts. The online finding aid for the Ava Helen and Linus Pauling Papers. Features detailed descriptions of the Paulings' correspondence, manuscripts, awards, personal libraries, photograph collections and more. A growing collection of fully-transcribed video of notable figures including Nobel laureates Francis Crick, Dudley Herschbach, William Lipscomb and Roderick MacKinnon among many others. The most detailed overview of Linus Pauling's ancestry, life and work available on the web. For both teachers and students interested in studying Pauling's life and work. Recounts Pauling's legendary application of quantum mechanics to the scientific understanding of molecular architecture, research that revolutionized structural chemistry and resulted in Pauling's 1954 Nobel Prize in Chemistry. Linus Pauling participated in one of the great "races" in scientific history – the quest to unravel the secrets of DNA. Though Watson and Crick ultimately solved the puzzle, Pauling's role in the story is highly intriguing. Updated frequently with fascinating stories from the world of Linus Pauling, The Pauling Blog also provides an inside glimpse into the latest news and activities of the OSU Libraries Special Collections. Images and descriptions of Pauling's many awards including honorary doctorates. An introductory-level exhibit for those just getting acquainted with Linus Pauling.